Bienvenue à Paris! So happy you could join us! I have lots to share with you about this one. Definitely my favorite party so far (although the Beatles party ranks up there too!). After Nina decided she would like a Paris party, I was super excited to start pulling it together. So many ideas kept running around in my head, I couldn't wait! After a long, dreary month of having Hannah in and out of the hospital with her appendicitis, it was actually like therapy for me to get this party going. Blue and yellow seemed fitting for the decorations, to reflect the charm of French cafés and flower markets. I bought a 25 foot roll of sky blue butcher paper, then repeatedly traced half of a dinner plate all along its edge. I cut along the lines where I had traced, then painted white stripes along the banner to create our nice little café awning. Yay! So happy to hang this in my kitchen! It instantly transformed the space. 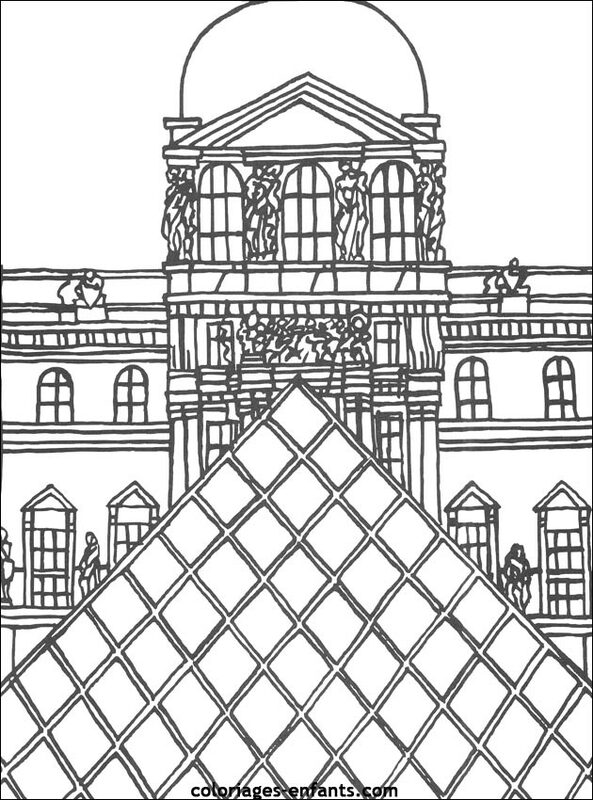 Next, I pulled out a Paris mural I painted seven or eight years ago (for a church activity, but I knew I'd use it again someday). Luckily, it was just the size of my kitchen wall, so I taped that up as well. I tossed some yellow and blue balloons around the room, hung blue and white tissue poms from ceiling, added a yellow tablecloth, blue plates, red cups, and red and blue patterned napkins. My little Eiffel Tower made a great centerpiece among the pain au chocolat (croissants baked with chocolate inside), and the mousse au chocolat (cheater's recipe!). As if we needed more sweets, I made Nina's birthday cake by stacking a couple dozen crêpes together with layers of strawberry jam and whipped cream. I've wanted to make a cake like this for years, and now I finally had a good excuse! A cute little banner of French flags completed it. For past parties, I've asked my brother Trevor to come as a pirate, and my sister Erika to come as a fairy godmother. I tried to think if anyone could come dressed up as a special surprise for Nina, and voila! I remembered my sister Hailey's and my brother-in-law Brad's amazing Halloween costumes. When I asked them if they'd join the party as a French street mime and a French chef, they were as excited as I was about it. We had to be very careful to keep it a secret from Nina. Hailey texted me when they were in the neighborhood, so I made sure Nina was downstairs when she and Brad came in. I quickly snapped a few photos of them before they went into hiding. Tables and chairs were set up downstairs for coloring while waiting for everyone to arrive. 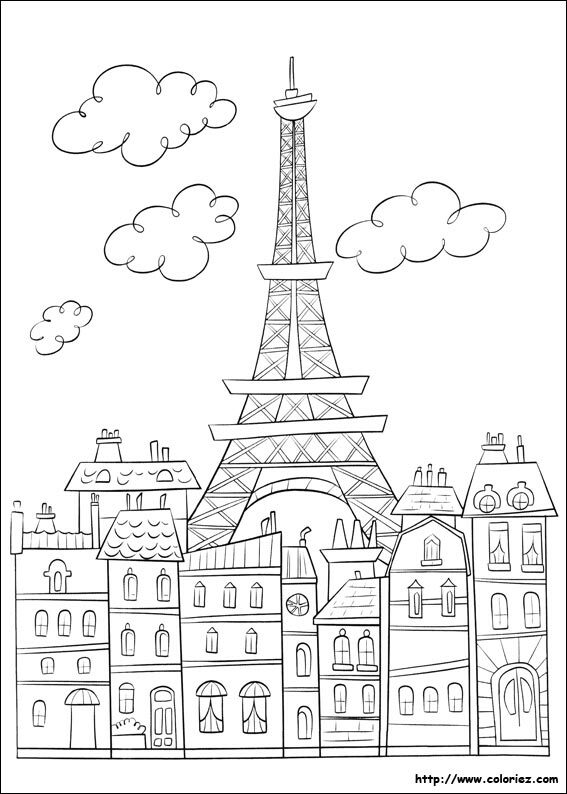 I printed copies of this cute coloring page and the girls were very detailed in coloring it! I had thought of doing an art project involving paint and glitter glue to create an Eiffel Tower painting, but you know, I already had enough to do! 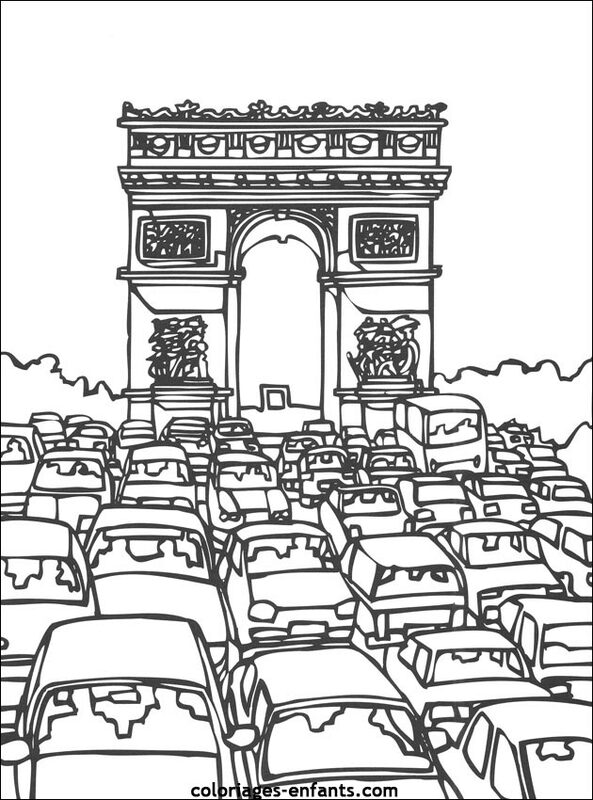 Here are other coloring pages of old France, l'Arc de Triomphe, and the Louvre. Once all the guests had arrived, it was time to go upstairs and explore Paris...and what did we find there? A French street mime! Nina smiled so big when she saw Aunt Hailey. Our lovely mime did an impromptu act, then each of the girls took turns being the mime (just like charades). I thought up some ideas for them to act out, just in case: mime game ideas All the miming was so great, especially with the Frenchy music still playing. Then it was time for treats at Café Nina. But where was the chef? We rang the service bell on the counter, and ta-da! Out popped a jolly chef from the pantry, complete with a French accent! The girls were laughing and so surprised, especially Nina. I'm so glad the whole plan worked, it was so funny! Our chef served all the food, and after that Nina opened her gifts. We had a little bit of time left, so I turned on the movie Madeline. For a younger crowd, the cartoon versions of Madeline would be great. Most of the girls had never seen the movie, or even heard of the books! So it was a fun way to end the party. Each girl went home with an Eiffel Tower tote bag filled with matching notecards (thank you Target dollar spot), a travel size paper city of Paris to cut and color at home, and chocolate "bisous" (kisses). Joyeaux anniversaire Nina! Et merci beaucoup Hailey and Brad! You made this party so much fun.